That tagline—coined for a very different sort of program—is an apt description of the strange (and strangely beautiful) hour of television that is Steven Moffat’s “Listen.” Arguments will, and should, and are intended to ensue about whether there is any kind of supernatural or extraterrestrial threat present anywhere in this episode, but to worry too much about that is to miss the point. At its core, “Listen” is about nothing, and about recognizing that nothing can be a very scary thing. After all, what’s hiding beneath the bed? Nothing. What’s lurking in the closet? Nothing. What is there to be afraid of? Nothing. We can tell our children, and we can tell ourselves, that nothing is wrong, that nothing can hurt us, that nothing will happen—but, after we say it enough times, “nothing” starts to sound like something sinister, like something frightening, like something that’s something. Nothing is coming to get us, and deep down we know it. It is a truism—and no less true for being one—that, in horror, it’s what we don’t see that scares us. Steven Moffat’s best work has always embraced this principle, and the best creatures he’s created for Doctor Who all rely on some variation of it: the monsters we can’t see (the Vashta Narada), the monsters that get us when we’re not looking (the Weeping Angels), the monsters we forget are real the moment we look away (the Silence). “Listen” is the next logical evolutionary step in this exploration of fear. (One almost imagines Moffat brainstorming on a chalkboard, just as the Doctor does here, and arriving at the idea for this episode.) Moffat understands that the monster we conjure in our imaginations is always more frightening than the one we finally see on-screen. So how much more frightening is the monster that isn’t really there at all? A scary thing that isn’t there is a scary thing that can’t be confronted, or outwitted, or beaten, or banished. It will never go away, because it was never really there in the first place. It is always with us, because is comes from us. It is, as Clara says here, a constant companion. It is the eternal miracle of Doctor Who that it can move from the insufferable silliness of “Robot of Sherwood” to the exquisite trance of “Listen” and still be, recognizably, the same show. I will lambast a shallow runaround like “Sherwood” every single time I review one—and I’ll do it with gleeful venom and the clearest of consciences—but the truth is I don’t expect them all to be great. All I hope for is one or two stories a season that demonstrate what Doctor Who is really capable of doing, and “Listen” fits the bill. For one thing, the experience it delivers is wholly unique: I can’t think of another episode of this show that feels quite like this one does. 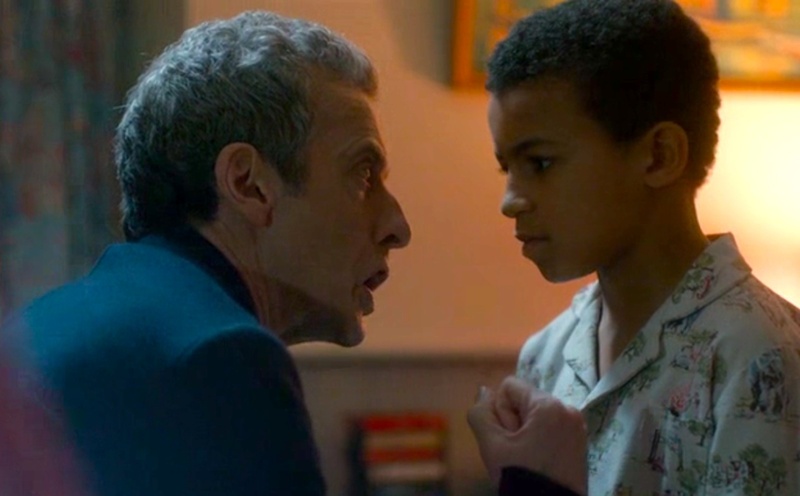 Moffat and Co. have been slowing down the pace in Season Eight, and that investment pays off terrifically in “Listen,” which allows scenes the room to breathe, and allows lines of dialogue to linger in resonant silence. Director Douglas Mackinnon and cinematographer Suzie Lavelle shoot with an eerie, uncanny patience: lots of still shots, and long shots, and oddly cropped close-ups. The visual palate is warm but muted, and even the funny and exciting bits feel muffled, lagged, almost as if everything is moving underwater. And—though I’m not among the haters of Murray Gold’s more bombastic scores—the almost subliminal music here makes this a stunningly different hour of Doctor Who: every scene pulses not with total quiet, but with a background hum of ambient noise that perfectly suits the fluidly unsettling aesthetic. The entire episode feels like a dream: not surreal, but just off, as if we’re never quite sure what we’re watching. And it a remarkable achievement of both Mackinnon’s direction and Moffat’s script that the domestic scenes have the same tone, and weight, and essential issue as the science-fiction elements. 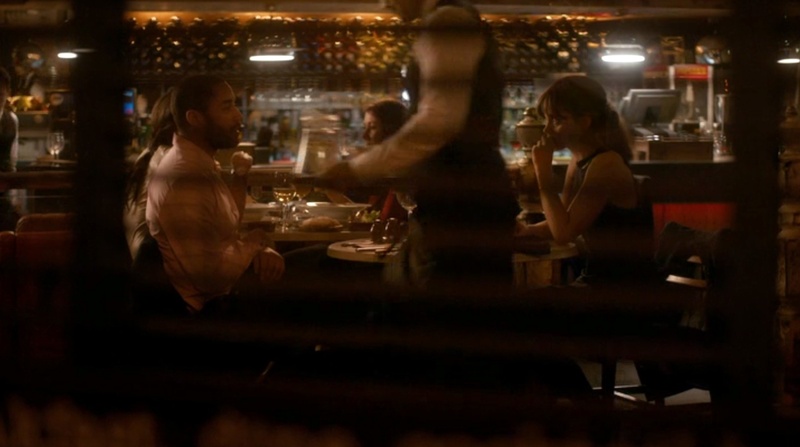 After the pre-credits sequence (of the Doctor alone in his TARDIS), the episode opens with Clara’s first date with Danny Pink (Samuel Anderson), as normal a human exchange as Steven Moffat has written since his BBC comedy Coupling. But this interaction is not presented as a contrast to what happens in the TARDIS this week: rather, it’s all of a piece. From a technical, tonal standpoint, this is effectively done. Presented in choppy, escalating snippets of conflict, and intercut with scenes of Clara’s post-date reaction, the scenes do not show a date going horribly askew so much as they evoke the feeling: that confused, frustrated, nightmarish sense of an encounter that should have gone so right going so inexplicably and irretrievably wrong. But these scenes are also thematically linked to the rest of the episode, in subtle but remarkable ways that demonstrate the cleverness of Moffat’s script. Because what, in the end, are Clara and Danny arguing about? Nothing. There is no problem: these are two people who like each other, who are attracted to each other, who want, more than anything, to make it work with each other—and yet there’s this frustrating nothing that keeps rearing its ugly head between them. Clara doesn’t really think Danny is a bad guy for being a soldier, and Danny doesn’t really think she thinks it—but they can’t get around it. Every time they think they’ve moved on past the fight, it erupts again. And what is at the center of this conflict except simple fear? In this case it’s simply a nervousness that’s natural for a first date, but it’s still just fear: irrational, illogical, irrepressible fear. The fear of the unknown, the fear of vulnerability, the fear of rejection, the fear of possibility, the fear of something you can’t even name. The fear of nothing, even when you know there’s nothing in particular to fear. If there was a real issue between them it could be solved, but those fears are internal, and intrinsic, and impossible to dismiss. Doctor Who has dealt with a lot of different kinds of fear in its 51 year history, but this is something different. Since I spent last week beating up on Mark Gatiss, I should mention here that—though “Listen” has echoes of a lot of previous episodes, including Russell Davies’ “Midnight”—the episode that comes closest thematically is Gatiss’s underrated Season Six story “Night Terrors.” Though flawed, that was an emotionally rich story that dealt very wisely with the irrational but pervasive fears of children, and the way the free-floating dread and insecurities of childhood can make ordinary and innocent things seem frightening. After spending decades convincing children that monsters were real, that was the rare episode that told children that there really is nothing to fear but fear itself. I said in one of my earlier reviews this season that Capaldi’s Doctor doesn’t look like he’s having fun: that the inherent joy and wonder we associate with the Doctor seems almost totally absent from this 12th incarnation. 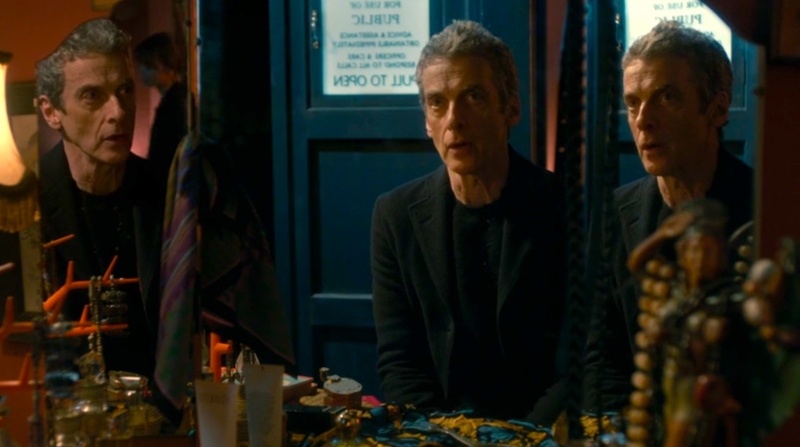 As the season progresses, however, this starts to seem less like a flaw in Capaldi’s performance and more like an interesting and troubling character development: this Doctor has lost his bounce a bit. He’s no longer living for the fun of adventures, and he’s no longer demonstrating the glee we are used to seeing the Doctor express at meeting new people, encountering new mysteries, learning new things. (Remember how thrilled Tennant and Smith’s Doctors were to meet every single person they encountered? Capaldi: not so much.) He is not even—though this element is always there—so enamored with the idea of saving people: in fact, we’ve seen him be completely untroubled by the people he couldn’t save. One gets the feeling that this Doctor would let entire worlds burn because he was busy, or bored, or couldn’t be bothered. Removing the Doctor’s trademark gregariousness, most of his manic enthusiasm, and even a little of his heroism, is a bold and risky move. But what it does is strip the Doctor of most of his externally-directed mannerisms, and allow Moffat and Capaldi to explore a more introverted, complicated character. “Am I a good man?” the 12th Doctor has asked this season, and this is now seeming like a more interesting question than some of the earlier seasons’ flirtations with the many sides of the Time Lord. Moffat has always been obsessed with the messiah/warlord dualities in the Doctor, but the show and the audience have always (at least since the early days of William Hartnell) assumed that the character is essentially good. His methods may be suspect on occasion, and his decisions may be questionable, and his temper may occasionally get out of control, but of course the Doctor is a hero, right? I don’t think that will change—and I don’t think it should change—but what Moffat and Capaldi are doing is complicating the character’s psychology in the most interesting way since Russell Davies introduced the emotional baggage of the Time War. Stripped of his do-gooder enthusiasm and his ingratiating, I-love-everybody mannerisms, the Doctor becomes a more psychologically complex figure. This Doctor doesn’t love everyone, and he doesn’t have a Messiah-complex, and he’s not particularly having fun—so why does he keep doing what he does? Moffat offers one possible explanation here: it is not intended to be a reductive one, I think—it’s not a simplistic key to the Doctor’s psychology—but it’s an expansion of our understanding of the character. He does what he does, in part, out of fear. If the monster you don’t see is the scary one, as I’ve said, it’s important to note that Doctor Who has always acknowledged that the converse is also true: to face a fear is to overcome it. The angels can’t hurt you as long as you’re looking at them; exposing the Silence is the way to defeat them; the little boy in “Night Terrors” must open his cupboard of scary things and face his nightmares. (Even the monsters in “Hide” turn out to be just star-crossed lovers once we get a good look at them.) Whenever you’re afraid of the thing under the bed, the best thing to do is look at it. This, then, is one explanation for why the Doctor does what he does: there are so many things in the universe to be afraid of, and he can’t stop running from one to the other, dragging them into the light of day and turning them into things that no longer need to be feared. Which is exactly the approach Clara takes here, when comforting young Danny (née Rupert) Pink (Remi Gooding). “You know what’s under the bed?” she asks the terrified child. “Me!” she says, crawling under it (and foreshadowing—exquisitely—the end of the episode). She entices young Rupert to crawl under with her, to show him that there’s nothing there to fear. Her argument is inherently, admirably logical. (Her reasoning that we always think there’s something behind us, and the space under the bed is what’s behind us when we’re asleep, is as good an explanation for that universal fear as I’ve ever heard.) And even when—in an inevitable but still incredibly creepy moment—the bed above them suddenly sags with weight, Clara remains logical: it’s another child, one who has snuck in to play a trick on Rupert. Her instinct—in true Doctor Who fashion—is to shed some light on the situation and take a good look at whatever is under the blanket. But what’s interesting is that the Doctor stops her: for perhaps the first time in Doctor Who history, he doesn’t want to solve the mystery, or get a good look at the monster. The explanation he offers makes a sort of sense—if there is a creature that mustn’t be seen, what is it likely to do if you look at it?—but it’s not very Doctor-ish, and it doesn’t ultimately hold water. In fact, nothing about “Listen” makes sense if we accept the Doctor’s theory about these unseen creatures. (Why would they suddenly start making themselves known, just because the Doctor is looking for them?) It only makes sense if we see them for what they are: figments of the imagination, there only because we fear they’re there. One wonders, therefore, if the Doctor’s greatest fear isn’t the end of fear: an end of wandering, an end of adventures, an end of mysteries. If you’ve wandered the universe for 2000 years, and conquered every kind of monster there is to encounter—and if even your greatest enemy turns out to have a potential for good—wouldn’t you worry that you might eventually run out of things to fear? Wouldn’t you fear nothing most of all? And so of course the Doctor has this one monster in reserve: the thing you can never find, never see, never face, never name, never overcome. Even at the very end of time, when he is—literally—the last being alive in the universe—the Doctor’s constant companion, fear, is still with him, lurking out of sight, and banging on the door. It’s the monster of imagination, for which he will never stop looking, of which he will never stop being afraid, and which he will never, ever vanquish. In George R.R. Martin’s A Game of Thrones, a young boy asks his father if a man can still be brave, even when he’s afraid. “That’s the only time a man can be brave,” his wise father responds. It doesn’t matter whether the thing we’re afraid of is real or not: fear is an essential part of us, “a companion, a passenger, a silent shadow.” It may, in fact, be the best of us; it’s a super-power, the thing that drives us, and drives us to be better. As Clara says in her extraordinary last monologue, when she has become the thing under the young Doctor’s bed, “it doesn’t matter if there’s nothing under the bed, or in the dark, as long as you know it’s okay to be afraid of it.” Fear can drive us apart—if we let it make us cruel or cowardly—but it can also bring us together, as it does, in the end, for Clara and Danny, as it does for Clara and the Doctor. The trick is not to conquer every fear but to acknowledge it, and share it, and let it power us forward. Barbara: You’re trying to help me. The Doctor: Fear makes companions of all of us, Miss Wright. Barbara: I never thought once you were afraid. The Doctor: Fear is with all of us, and always will be. Just like that other sensation that lives with it. The Doctor: Your companion referred to it: hope. Hope is the constant companion of fear. Fear is a super-power, and we can’t be brave unless we’re also scared. We will always fear the dark, and we will always know, too, that we need the dark in order to see the stars. Whenever I pillory a terrible episode like “Robot of Sherwood,” I say that I wouldn’t be bothered by the plot holes if the episode made up for them by having real emotional content and something to say. This episode is a good example of what I mean: I haven’t read other reviews or comments yet, but I’m absolutely certain there is a portion of the fan community that is throwing fits about the lack of resolution and explanation for certain things in this episode. What was under the blanket? What was banging on the door? Why can the TARDIS suddenly go to time-locked Gallifrey? Why does the Cloister Bell sound if there’s no real danger? Why couldn’t the BBC even be bothered to paint Orson Pink’s spacesuit to look like a different prop from the one they’ve used a dozen times? I’m willing to argue (in true pedantic fashion) about any of these points (except the last one, which is really unforgivable), but the truth is: I could give a toss. Give me an episode with the emotional and thematic richness of this one, and my nitpicking instincts disappear completely. There are a lot of layers to this onion that I didn’t peel back, but—since this is already a long post, and since another episode is barreling down on me in a little over 24 hours—I’m going to cut my “additional thoughts” short this week. I’m curious to hear what you all thought of this one; let me know in the comments below.